In nutritional medicine, in my opinion, there is no other topic that has been so misunderstood for so long. Fat has been given a very bad rap for quite some time now. Remember the low-fat craze? Everyone was telling us that fat was making us sick and causing a whole host of chronic diseases, like heart disease, stroke, and diabetes. Food manufacturers came up with a brilliant marketing plan: replace the fat in foods with sugars and other simple carbohydrates and call it low-calorie or calorie-reduced. We just got fatter and fatter consuming these foods. The net result of this was big profits and big misconceptions. Even experts, government agencies, and healthcare providers were jumping on the bandwagon. And that resulted in a lot more confusion, misinformation, and hysteria regarding fat and its role in human health. The other result was the worsening of the trends in obesity and the prevalence of type 2 diabetes throughout the U.S. Since the release of the latest research, which indicated that saturated fat intake was not associated with any increased degree of disease risk, the tide has turned, so to speak. Fat is an essential part of our diet, as there are several different types that are considered critical for human health and need to be consumed in food. Fat in nature is either saturated or unsaturated which makes it a solid or oil at room temperature. Saturated fat comes from animal meats, eggs, dairy products, and tropical oils like coconut oil. Unsaturated fat comes from vegetables, seafood, fish, fruits, nuts, plants, and seeds. It can be unsaturated, like the omega-3 family found in fish or seafood; monounsaturated, like the oils derived from canola, avocadoes, or olives; or polyunsaturated, as in corn, peanut, or sunflower oils. The issue with fat isn’t just how much of it you eat, but also the types of fat you consume. 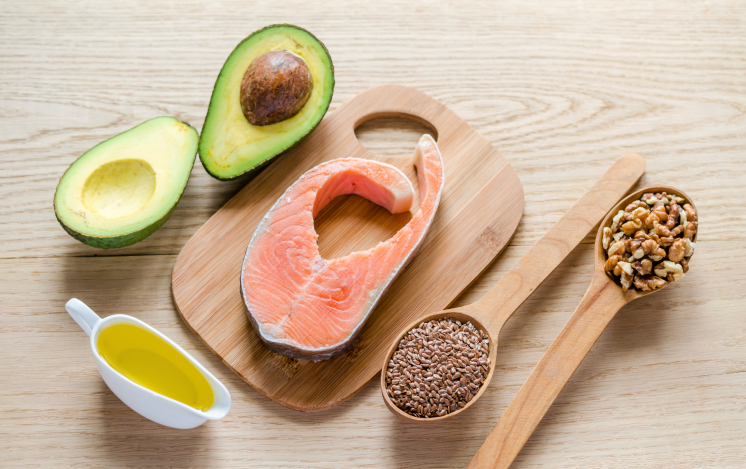 The problem here is that if you replace all the saturated fat in your diet with polyunsaturated fats, an imbalance will develop between the omega-6 and omega-3 fats. In my opinion, trans fats found in hydrogenated oils or in deep-fried foods should be completely avoided. This is the worst type of fat you can possibly eat. This is now the case, with a ratio from 20:1 to 10:1 omega-6 to omega-3 being the norm. It should be two or three to one at the most. This larger ratio causes an increase in inflammation inside the human body, which acts as a breeding ground for chronic diseases. Now, I do not propose that people consume large amounts of saturated fats, like red meat, cream, and lard. These foods do increase cholesterol and inflammation, no doubt. However, consuming free-range meats and eating better-quality fats, which can be found in extra-virgin olive oils, avocadoes, nuts, flax, and oily fish like salmon, can not only not cause weight gain, but it can also reduce your risk of ever experiencing heart disease, stroke, or diabetes. Such is the case in the Mediterranean style of diet, where moderate amounts of fat are consumed and health risks are reduced in accordance with the type of fat consumed. “Fats and Cholesterol,” Harvard School of Public Health web site; http://www.hsph.harvard.edu/nutritionsource/fats-and-cholesterol-1/?utm_source=SilverpopMailing&utm_medium=email&utm_campaign=Nutrition%20Source%20-%20June%202014%20(1)&utm_content=, last accessed June 24, 2014.